A potato based snack with small pierced holes in a round shaped chip. 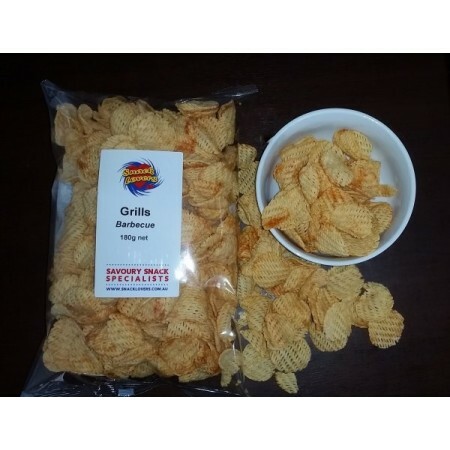 It has a light tasty texture and is flavoured with a traditional Barbecue flavour. Snack (Dehydrated Potato, Potato Starch, Salt, Natural Flavours (Paprika, Tumeric)). Hi-Oleic Sunflower Oil. Seasoning (Maltodextrin, Salt Flavour Enhancer (621, 635), Dextrose, Spices, Flavour (Natural), Sugar, Acidity Regulator (262), Hydrolysed Vegetable Protein, Corn Starch, Vegetable Powder (Onion), Garlic), Tomato Powder, Vegetable Oil, Anti-Caking Agent (551)).